Can't see new Sage Intelligence reports in Report Manager? Have you recently upgraded your Sage Intelligence Reporting software and found that you can’t see your new or updated reports in the Report Manager now? There is no need to worry, you can still quickly and easily access your reports by using the Report Managers’ "Bulk Import and Update" feature. Bulk importing is used to automatically import new and updated reports that are included with the new version of Sage Intelligence into your Report Manager. The Bulk Import feature does not delete or change your existing reports or any of the settings in the reports. 1. While in Report Manager, select Home. 2. Navigate to the Tools tab and click Bulk Import/Update. 3. 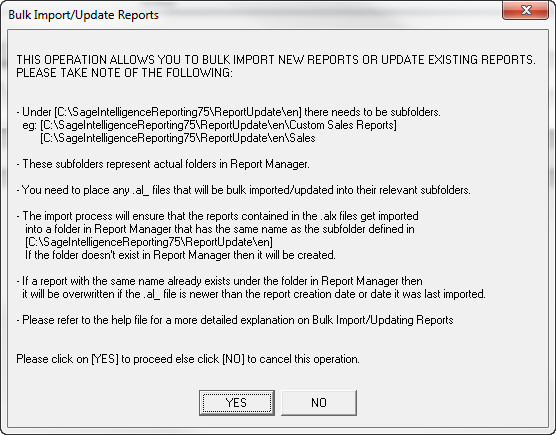 Select YES on the Bulk Import/Update Reports dialog box that pops up. This will start the importing of your new Sage Intelligence reports to your Report Manager. Bulk importing can be used to add additional reports to your Report Manager also. To do this, please follow the instructions on the Bulk Import/Update Reports dialog or view the information in the Help File. Once the import is successful you will be able to access any of your reports in your Report Manager. For answers to your questions, please contact Equation Technologies. We are a certified Sage partner.